Chicago is home to an array of beaches, from well-hidden “street-end” oases to bustling Downtown spots featuring every summer activity imaginable. Our 26 miles of shoreline feature something for every personality and interest, and as we all know, Chicago summers are fleeting, so it’s high time you branch out and start exploring them all. This primer sums up all of the city's beaches, starting in Rogers Park and working south, and what you need to know before you go. Blink and you may miss the city’s northernmost beach. This particular street-end spot isn’t ideal for sunbathing, particularly since its extremely tiny patch of sand occasionally gets buried under rising water levels. What to know: Spread out your blanket on the soft grass of the surrounding Juneway Terrace Park and gaze at the lake from there. It’s much more comfy than laying on the rocky shore. 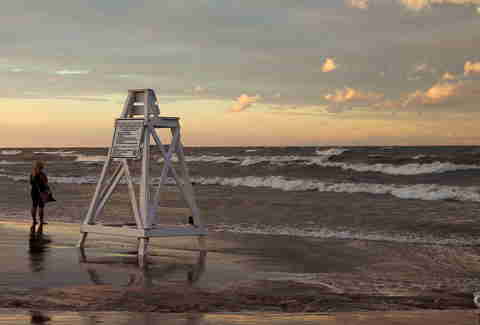 Much to the chagrin of local residents, rising water levels have caused Fargo Beach to pull a bit of a disappearing act in recent years, and it's no longer open for swimmers. 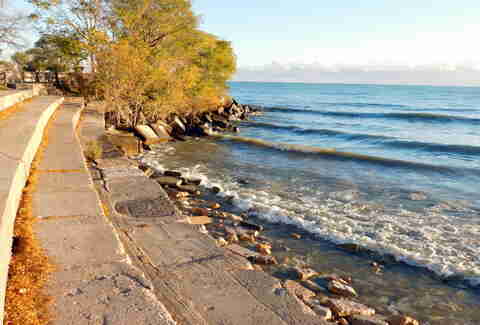 Thankfully, neighboring Marion Mahony Griffin Beach (formerly known as Jarvis Beach) remains unaffected. What to know: Chicago native and longtime Rogers Park resident Marion Mahony Griffin was one of the world’s first licensed female architects, known for helping design Australia’s capital city Canberra in the early 1900s. Much like its neighbor to the north, Rogers is quite rocky and has minimal sand. Still, the adjacent grassy area is an ideal spot to relax with a book, and the on-site tennis courts make it a popular spot for local residents. What to know: This is not a dog-friendly park, and locals can get ornery if you bring your four-legged friend with you. Also, the lifeguards have a reputation of taking their jobs a bit too seriously, so be on your best behavior. Boasting sandier, although still somewhat rocky, terrain, Howard Beach is slightly more traditional than the other postage stamp-sized street-end beaches nearby. The 4-acre park includes a playground, making it a popular family destination. What to know: If you’re looking for an Ibiza-style party, head elsewhere. The family vibe isn’t conducive to wildness. Celebrate Loyola’s recent NCAA run on these adjacent beaches stretching eight blocks from Touhy to Pratt, which make a popular option for those seeking a more laid-back scene. 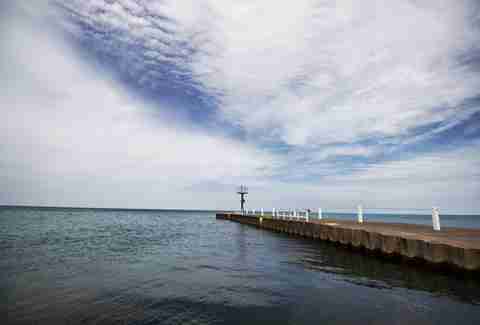 There's also a fishing pier, softball fields, picnic grounds, a basketball court, and a playground located at Touhy and Sheridan. What to know: Check out the colorful art along the sea wall. Every Father's Day weekend, Rogers Park residents join forces for Artists of the Wall Festival in which neighbors help paint a 600-foot community mural, all while enjoying live music. Also, Crepes on the Beach is also a relatively unknown gem. Formerly known as Pratt Beach, this spot was was renamed in honor of Tobey Prinz, a community activist and founding member of the Rogers Park Community Council, in 2014. The fishing pier that separates this quiet stretch from the southern end of Loyola features jaw-dropping skyline views. What to know: In 2016, the beach developed a reputation as something of a Pokémon Go haven, so head there if that’s still your thing. This beach bears no relation to Freddie Prinze Jr. -- in case you were wondering. Fairly well-hidden behind residential buildings, both Helen Doria and Hartigan Beach tend to be frequented primarily by area residents. However, don’t let that stop you from paying a visit. 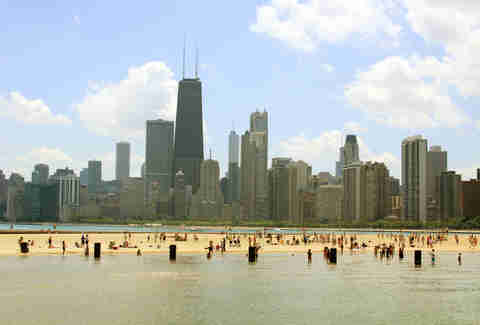 Remember: All of Chicago’s beaches are completely open to the public. In 2016, the portion known as Columbia Beach was renamed in honor of Helen Doria, a well-loved local advocate who passed away in 2012. What to know: There is no bathroom at Hartigan, but you can use the one at Loyola’s student center about two blocks south. Lane Beach tends to be frequented by those looking for a more laid-back experience than nearby Osterman Beach. A playground is located on the west end, making it a popular after-school stop for families in the area. And who knows -- maybe this is the summer those mysterious “crop circles” in the sand return? What to know: Moody’s Pub is a five-minute walk from here. Park there, grab a burger, and then relax in the sun for optimal digestion. Berger Park’s Waterfront Café, possibly the cutest outdoor waterside bar in all of Chicago, is also a short jaunt away. Commonly known as Hollywood Beach, Osterman is a favorite of Northside residents. While families tend to set up shop on the north end, the south end has been a popular summer hangout for the LGBT community for many years. Visitors can rent paddleboards or take classes with Chicago Paddle Co., so between that and the free Wi-Fi, you basically don’t have any reason to ever leave (just don’t tell the police we said that if you get caught there after-hours). What to know: Be sure to stop by Nacho Mama’s Beach Bar, which, naturally, serves nachos, as well as tacos and a bunch of tequila cocktails. It might not be the best idea to go there before paddleboarding, though. Foster can best be described as a slightly less crowded version of Montrose, attracting a diverse mix of younger beachgoers as well as families. The adjacent grassy park area is a popular location for gatherings, including Chicago Full Moon Jam, which features flame dancers, drumming, and more. While a portion of the beach is reserved for dogs, rising waters have rendered it inaccessible in recent years. Thankfully, Montrose Dog Beach is just a stone’s throw away. What to know: If the main area is crowded, the grassy section on the hill past the beach is one of our favorite spots to chill out in the city. Thanks to ample parking and a wide variety of amenities ranging from free Wi-Fi to jet ski and kayak rentals, Montrose Beach is one of the most popular areas in the city. There are plenty of food options here, including The Dock, which features live music, tropical cocktails, and a menu featuring everything from pierogi to seared yellowfin tuna wraps. Several other smaller concessions are located around the area serving tacos, fruit, and elotes, which you should definitely try. The north end is reserved exclusively for dogs and is Chicago’s first off-leash beach. The south end, on the other hand, is reserved for an entirely different purpose: a gorgeous native dune ecosystem that attracts an array of migrating birds. Take a walk through this 8-acre nature habitat and you’ll quickly forget that you’re in the city. What to know: Montrose Point is both one of the most beautiful places in the city and a place you need to visit before you die. So yeah, we recommend going. While you wouldn't want to lay out here for obvious reasons, your pup will certainly love doing so. Given that this particular doggie haven is small in size and not as busy as others in the city, it’s a good starting point for anyone who wants to test the waters with their pup before letting it loose at a bigger park like Montrose. What to know: This spot, within walking distance of Wrigley, makes for a fine excursion after a Cubs day game. Plus, the lakeside Sydney Marovitz Golf Course, easily the finest public course in the city, is just a stone’s throw away. 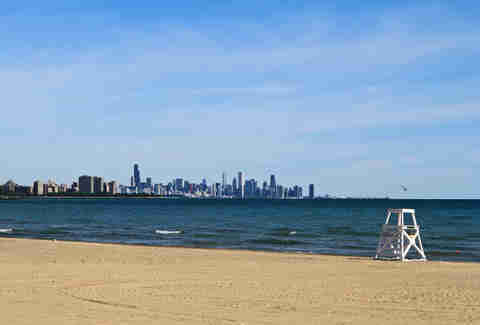 North Ave Beach is a favorite among young professionals who wish to see, be seen, and stay active. In addition to the variety of vendors and concessions -- including everyone’s favorite summer hangout, Castaways -- North Ave Beach is home to a bunch of fun activities. 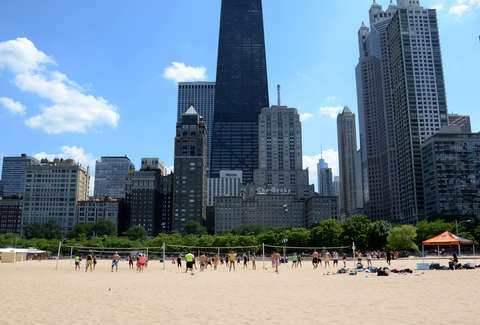 Visitors can partake take beach yoga classes, go wakeboarding and paddleboarding with Chicago SUP, rent a kayak, play beach volleyball, or take advantage of the free Wi-Fi and pretend to get some work done. Of course, it’s also a popular spot for summer events like The Chicago Air and Water Show. What to know: Castaways is no longer the only game in town when it comes to boozing at North Avenue Beach, thanks to the recent opening of the more upscale Shore Club. Serving Mediterranean-inspired cuisine and beach-themed drinks in three distinct spaces near the lakefront path, the property includes a laid-back open-air bar and fancy indoor restaurant with floor-to-ceiling windows plus the exclusive RSVP-only “Oasis at Shore Club” with cabanas and day beds. A bit further up the road, check out the beautiful new Lakefront Restaurant at Fullerton and the lake serving upscale Midwestern fare from chef Cleetus Friedman in the historic Theater on the Lake building. While not technically on beach property, it’s more than worthy of the short diversion. 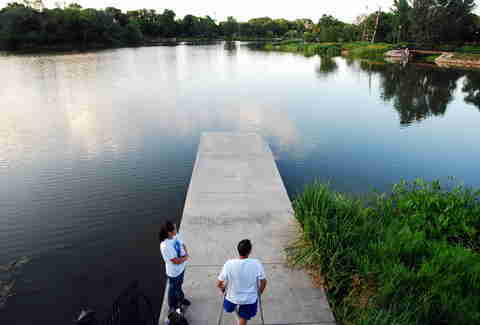 Humboldt Park boast the city’s only inland beach. Popular with neighborhood families, it reopened in 2016 after being temporarily closed while the Park District worked to redevelop the swimming pond and improve water quality. What to know: The only thing better than the reopened Humboldt Park Beach is the Humboldt Park Boathouse Café, which serves great breakfasts and burgers, as well as beer and wine. 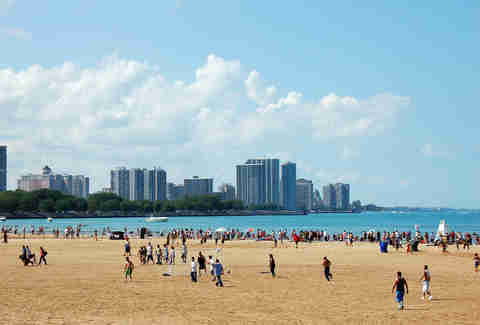 During the day, Ohio St Beach is mostly frequented by area residents, families squeezing in some time in the sun before or after a visit to nearby Navy Pier, and the occasional local playing hooky. Come 5pm, the west end becomes occupied by distance swimmers eagerly swapping their work garb for wetsuits. 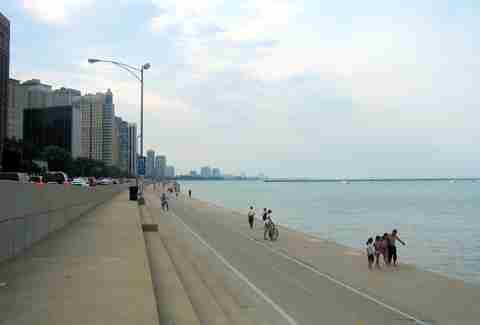 While distance swimming is permitted elsewhere in the city, Ohio St is Chicago's only north-facing beach, making it possible to swim 800 meters from the shore to the Oak Street curve without ever being more than a few feet away from the seawall. Take in the view with tropical cocktails at Caffè Oliva, which offers fantastic water views. What to know: We’ve already called it one of the most underrated beaches in Chicago and one of the best beaches on the Great Lakes. The real highlight of this quiet little area is its proximity to the underrated Milton Lee Olive Park, where you can enjoy a peaceful post-sunbathing strolling under the shady trees. 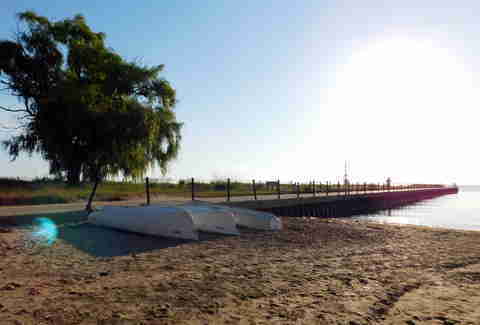 Situated on the eastern edge of Northerly Island, 12th St Beach happens to be one of the most well-hidden in Chicago. While distance swimming is allowed here, too, many visitors report running into submerged wreckage out there. Depending on the day and time, you may even be able to listen in on concerts taking place at neighboring Hungtington Bank Pavilion. What to know: Fact: The only thing better than a hidden beach is one with a hidden taco shop. This stretch of lakefront formerly known as 31st Street Beach has received several impressive upgrades over the last few years. Not only did it get a brand new name, it now has a public fishing dock, a “green roof” picnic area, and a playground with a climbing wall. Along with paddleboard and jet ski rentals at Chicago Water Sports, there are a wide variety of events that attract a more grown-up crowd after dark, ranging from spin classes and live music to movies. Best of all? There’s now an on-site parking garage, which means you’ll spend less time jockeying for a space and more time in the sun. What to know: With live jazz, house music dance parties, and a prime waterfront location, Pier 31 is one of Chicago’s most overlooked beach bars. Be sure to stop by. Opened in 2009, Oakwood -- also known as 41st Street Beach -- is Chicago’s newest beach and still somewhat of a hidden treasure. Although it’s relatively small in size, it has a great beach house, a nearby picnic area, and volleyball courts. And, of course, you can’t beat the view! What to know: Chicago’s newest beach festival, Mamby on the Beach, takes place here every summer, with Common, Spoon, and Grizzly Bear headlining in 2018. Situated behind the Museum of Science and Industry, 57th St Beach was designed by renowned designers Olmsted and Vaux as part of the World's Fair. Parking is relatively easy west of Lake Shore Drive, and the beach is accessible via the pedestrian underpass. Once the sun goes down, head on over to nearby Promontory Point and gather around a bonfire pit (reservations needed). What to know: While the criminally underrated Promontory Point is worth a visit to this beach alone, the recent opening of nearby music venue The Promontory (from the folks behind Empty Bottle, Thalia Hall, and Moneygun) makes the trip even more appealing. South Shore Beach is part of the South Shore Cultural Center, a historic landmark featuring a solarium, formal dining hall, and nine-hole golf course. The adjacent nature sanctuary has sand dunes, a prairie landscape, a small wetland, and a butterfly garden, and the beach itself features a circular beach house with concessions, restrooms, and showers. What to know: If you don’t feel like driving and haggling over parking, the South Shore Metra drops you off steps away. 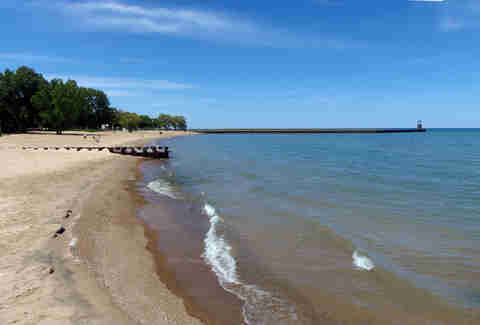 Located at the southern end of beautiful and historic Jackson Park, 63rd Street Beach is popular among neighborhood residents. In addition to amenities like a historic beach house that dates back to 1919, showers and concessions, this family-friendly spot also features a spray pool play area and a playground. Best of all: This is one of the few places in the city where you can still find shells and beach glass. What to know: If you’re ever gonna get married, the stunningly opulent 63rd Street Beach House is the place to do it. Like many South Side beaches, Rainbow has a lovely view of the Downtown city skyline, as well as Wi-Fi, free parking, a playground, handball courts, and a nine-acre natural dune habitat. What more can you ask for? Located a stone’s throw away from the Indiana border, you'll find the delicious seafood spot Calumet Fisheries just a short 5-minute drive from here. Given that it’s not the most populated beach in Chicago, this stretch of shoreline is ideal for large gatherings. 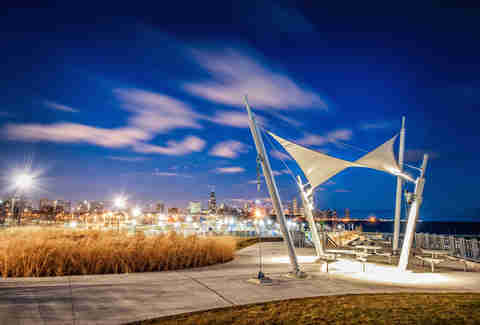 As part of the 200-acre Calumet Park, the area features a boat launch, softball and soccer fields, a playground, and several different concession stands. What to know: The view of smokestacks and factories isn’t the most enticing in the world, so if you’re looking for scenic beauty, head elsewhere. Lisa Chatroop daydreams about eating elote at Montrose Beach. Invite her to your next beach party via Twitter: @LisaChatroop or DailyUrbanista.com.